The access to Stejarii Country Club supposes your acceptance of Stejarii Country Club’s regulations, as well as the assumption that you have read the previously mentioned regulations. Therefore, any subsequent complaint related to the below mentions will not be taken into consideration. 1. Minimum 3 participants must attend the aerobics class. 2. Out of respect for the other participants, please be 5 minutes earlier than the class time. 3. If you are late, you are allowed to enter the studio solely in the warm-up phase, respectively in the first 5 minutes after the class begins. 4. The personal initiatives related to exercises during the class are not allowed but under the trainer’s agreement (for example, a personal routine, the use of dumbbells or other exercises conflicting with the current programme). 5. If you must leave before the class ends, please inform the trainer before it starts and try to go to the back of the studio so that you do not disturb the other participants when leaving the studio. 6. Please inform the trainer or the activity coordinator after the end of the class on any suggestion or comment related to the provided programme. 7. As for the classes requiring equipment (dumbbells, mattresses, etc. ), after the class ends, please take them back to the storage place in the studio. 8. For the classes requiring mattresses, please use a towel. At the end of the class, the mattress will be cleaned with a solution available in the studio and thereafter, it will be taken back to its place. 9. It is mandatory to use adequate sports shoes and clothing, in all classes, save the yoga, stretching and pilates classes where the trainer will recommend you footwear specific to the class. 10 .If during the class you feel dizziness, breathless, faintness or pain in the chest, either you continue to walk in place smoothly, or you stop and inform the trainer. 11. Drink water. Hydration is important during effort. 12. You use the equipment without the supervision of a trainer on your own responsibility. 13. It is forbidden to use the mobile phone in the aerobics studio. 14. The members/ clients must not use any audio or video (including pictures) recording devices within the premises. If such rule is violated, such person may be requested to leave immediately the Club. 15. Smoking (including electronic cigarettes) is forbidden in the aerobics studio. 16. It is forbidden the use of the equipment in the aerobics studio by children under 14 years or persons under the influence of alcohol, drugs, hallucinogens, stimulants, depression medications or any substances diminishing the physical and mental abilities and/or their consumption during the training. 17. The indecent, noisy behaviour or any behaviour whatsoever that might generate conflicts or disturb the other present persons are forbidden. 18. The club’s members/ clients must comply with all the posted indications and those ones from the Club’s staff or trainers. 19. Please inform the Club’s staff on any danger or non-compliance with the regulations (quarrels, injuries, indecent behaviour, etc.). 20. For safety and comfort purposes, the Club reserves the right to request to any participant to leave the premises and to use the adequate means to this purpose. 21. Train yourself under full safety conditions, showing respect to the others. 1.The failure to comply with these warnings may cause serious injuries and/or property damages. 2. All the players must read, be aware of and comply with these rules for a safe game. 3. DO NOT HANG to the basket, backboard, supports or net. 4. During the game, especially when you perform dunk shots, keep away your face from the board, basket and net. You may suffer a serious injury if your teeth/ face come/s in contact with the backboard, basket or net. 5. During the game, do not wear jewelries (rings, watches, necklaces, etc.). The objects might get stuck in the net. 6. Verify the system before every use in order to see whether there is excessive wear and tear, corrosion and request for it to be repaired before using it. 7. Never play if the equipment is damaged. 8. It is mandatory to use adequate sports shoes and clothing. 9. If you feel dizziness, breathless, faintness or pain in the chest, either you continue to walk in place smoothly, or you stop and inform the staff. 10. Drink water. Hydration is important during effort. 11. You use the equipment without the supervision of a trainer on your own responsibility. 12. The members/ clients must not use any audio or video (including pictures) recording devices within the premises. If such rule is violated, such person may be requested to leave immediately the Club. 13. Smoking (including electronic cigarettes) is forbidden. 14.It is forbidden the use of the equipment by persons under the influence of alcohol, drugs, hallucinogens, stimulants, depression medications or any substances diminishing the physical and mental abilities and/or their consumption during the time spent in this area. 15. The indecent, noisy behaviour or any behaviour whatsoever that might generate conflicts or disturb the other present persons are forbidden. 16. The club’s members/ clients must comply with all the posted indications and those ones from the Club’s staff or trainers. 18. For safety and comfort purposes, the Club reserves the right to request to any person to leave the premises and to use the adequate means to this purpose. 19. Please spend your time in this area under full safety conditions, showing respect to the others. 1.Minimum 3 participants must attend the cycling class. 2. It is strictly forbidden to talk on the phone during the cycling classes. 3. Please be in time for the cycling class. Out of respect for the other participants, please be 5 minutes earlier than the class time. 4. If you are late, you are allowed to enter the studio solely in the warm-up phase, respectively in the first 5 minutes after the class begins. 5. The personal initiatives related to the exercises are not allowed but under the trainer’s agreement (for example: a personal routine, other exercises conflicting with the current programme). 6. If you must leave before the class ends, inform the trainer before it starts. Try to go to the back of the studio so that you do not disturb the other participants when leaving the studio. 7. Please inform the trainer or the activity coordinator after the end of the class on any suggestions, comments related to the provided programme. 8. At the end of the class, the cycling bicycle will be cleaned with disinfectant available in the studio. 9. It is mandatory to use sports shoes or the cycling shoes. 10. It is forbidden the use of the equipments in the cycling studio by children under 14 years or persons under the influence of alcohol, drugs, hallucinogens, stimulants, depression medications or any substances diminishing the physical and mental abilities and/or their consumption during the training. 11. Smoking (including electronic cigarettes) is forbidden in the cycling studio. 12. Please do not intervene on the equipments during their operation and do not damage them. 13. If during the class, you feel dizziness, breathless, faintness or pain in the chest, keep on pedalling easily or stop pedalling. 14. Drink water. Hydration is important during effort. 15. You use the cycling bicycles without the supervision of a trainer on your own responsibility. 16. Train yourself under full safety conditions, showing respect to the others. 20. Please report to the trainer or the club’s reception desk any failure or malfunction of the cycling bicycles. 21. Please make to the trainer or the activity coordinator any suggestion related to the provided programme. 22. For safety and comfort purposes, the Club reserves the right to request to any participant to leave the premises and to use the adequate means to this purpose. 1.The golf area may be used after making a prior reservation or if the stands are unoccupied, by checking whether they are available with the Golf Reception Desk. 2.The players may make reservations at the Golf Reception Desk and the cost amounts to RON 10 (inclusive of VAT) per hour, per stand. The playing time may be extended as long as there are available stands. The equipment provided by the Club includes a basket of balls and the required golf clubs. You may cancel the reservation at least 2 hours before the scheduled time in order to avoid any subsequent penalties. Following 3 non-complied reservations in 3 months, the Club reserves the right not to allow the reservation of the stands by you the following month. 3. If you are late more than 15 minutes in relation to the scheduled time, your reservation is cancelled and the paid fee is withheld by the Club and you are not entitled to the reimbursement of such cost and the stand may be used by another person, according to the “first come, first served” rule. 4. The golf area may be used according to the opening hours: Monday: 2:00 pm – 9:00 pm; Tuesday – Sunday: 10:00 am – 9:00 pm. The access is provided according to the scheduled reservations, solely during the opening hours. 5. Solely one person is allowed to use a stand, save the family subscription players who are allowed that two persons use one stand. 6. The green carpets are intended solely for players. The visitors must walk only on the red side of the carpet in the driving range area. 7. The driving range manager has maximum authority in the golf area and it is mandatory to comply with his/her instructions. 8. The movements specific to the shots will be practised solely on the specially arranged carpets. It is strictly forbidden to exercise the movements on the green area in front of the carpets. 9. For security reasons, it is forbidden to move the carpets from the specially arranged areas. Please contact the driving range manager if you consider that the removal of your carpet is absolutely necessary. 10. It is forbidden the access with food in all the driving range areas, save the terrace. 11. It is forbidden the access with food and drinks from outside the golf area. It is not allowed the access with drinks in the putting green and chipping green areas. 12. It is mandatory to level the sand obstacle in the chipping green, following its use. 13. The children under 6 years must be permanently accompanied by an adult in all the driving range areas. 14. It is forbidden the access to the golf area with inadequate clothing (flip-flops, swimsuit, etc.). You must wear a collar T-shirt. 15. Do not throw any object whatsoever on the golf area. The improper behaviours, the improper use of the balls and clubs or those ones that might generate risks of injury and any other behaviour whatsoever that might generate conflicts or disturb the other present persons are forbidden. The players are liable for any damage caused by their behaviour. Do not disturb the players until the playing time expires. 16. It is forbidden the access to the driving range area, of the persons under the influence of alcohol or drugs, hallucinogens, stimulants, other depression medications or any substances diminishing the physical and mental abilities and/or their consumption while using the courts. 17. The Club reserves the right to request to any participant to leave the premises, irrespective of the reason and to use the adequate means to this purpose. 18. SCC and GDR do not assume the liability for the clients’ injury in the Golf Driving Range or for various medical impairments arising from the activity carried out by the clients in the Golf Driving Range. 19. The members/ clients must not use any audio or video (including pictures) recording devices within the premises. If such rule is violated, such person may be requested to leave immediately the Club. 20. Smoking (including electronic cigarettes) is forbidden in the aerobics studio. 21. The club’s members/ clients must comply with all the posted indications and those ones from the Club’s staff or trainers. 22. Please inform the Club’s staff on any danger or non-compliance with the regulations (quarrels, injuries, indecent behaviour, etc.). 23. For safety and comfort purposes, the Club reserves the right to request to any person to leave the premises and to use the adequate means to this purpose. 1.It is allowed the simultaneous presence of maximum 6 persons. 2. The players may reserve the Putting Green area for 1 hour directly at the Golf Reception Desk or on phone and the cost amounts to RON 40 (inclusive of VAT) per hour. 3. Each player has the right to use 3 balls. 4. It is mandatory to use the personal balls and not those owned by the driving range. 5. It is strictly forbidden to exercise the short stroke (the approach shot). 1.Please keep silent in order not to disturb the other players. 2. After the reserved time expires, you may make a new reservation taking into account the number of stands available at that time. 3. The Club reserves the right to change the opening hours of the golf area and such changes are notified in due time both on the website and at the golf reception desk. 1.This playground is designed for kids with ages from 3 to 12 years. 2. The kids under 3 years must be accompanied/ supervised by an adult and cannot be left alone in the care of the Kids Club’s staff. Such case arises as kids require individual increased care and the staff in such area provides solely the entertainment and the safety of larger groups of children. 3. The kid’s access is allowed only if he/she or his/her parent is a client of the complex (Stejarii Country Club/ Shiseido Spa). The time spent in the area for children is limited to maximum 3 hours per day. The extra time or the payer clients’ kids access is provided after the payment of the fees in amount of Euro 5 (inclusive of VAT) per hour. The said 3 hours in the playground may be split according to the kids’ needs. 4. The parent or the adult guardian must accompany the kid to the Kids Club and fill out the form for him/her. All the kids will be written down in a check in/ check out list. 5. The Kids/Teens Club’s staff has the right, but not the obligation to provide that all the kids admitted to the playground are healthy in satisfactory terms, so that we avoid as much as possible that other kids get sick. If the staff identifies such cases, they will urgently inform the immediate superior and will request to the attendant adult to take the kid away. 6. We do hereby ask the parents/ the guardian to support our efforts in providing a good behaviour and civilized manners to all the kids. (A) If a child has disciplinary issues, Stejarii Country Club may restrict the access to the area or may discontinue, suspend, terminate the child’s membership contract. There are not allowed: the aggressive games, the hits, the violent or improper behaviour and language used to children by other children or by adults. So that all children enjoy relaxation and cheerfulness, no one is allowed to use vulgar words or behave in an uncivilized way. The attendants must inform the children on the provisions of these Regulations and provide that such regulations are complied with. 7. The consumption and the access to the playground with food, chewing gum, drinks, etc. are prohibited. 8. It is prohibited the access with blunt, hard, sharp objects to the playground. 9. It is not recommended to wear glasses, large earrings, necklaces or bracelets in the playground. 10. It is forbidden to climb the slides in the opposite direction, to throw toys from one area to another. It is forbidden to slide with the head forward. 11. Kids are not allowed to bring jewellery, personal toys or objects, including mobile phones, electronic devices (such as iPods, MP3 players, PSP or similar objects). Stejarii Country Club will not be liable for their loss or for accidents caused by them. 12. If the kid suffers from a disease that requires special care, the club’s member/ client is asked to mention it when he/she fills out the registration form and if necessary, he/she is asked to to remind it to the Kids Club’s staff, according to the case or activity. 13. If the child needs assistance when going to toilet or the child has other problems, he/she informs the supervision personnel. 14. In order to maintain the hygiene conditions, all the users will wash and disinfect their hands before going to play, as well as after going to the toilet. 15. The child will be checked out only to the same person accompanying him upon registration. The sole exception is made when Stejarii Country Club receives written instructions from the adult accompanying the child upon registration specifying that another person will take over that child. The instructions will comprise explicitly the identification data of the person taking over the child. 16. The Kids Club’s staff is not authorised to give any medical treatment, medicine, prescription or medication. 17. It is not allowed the access of the children showing signs of influenza or flu (sneezing, coughing, mucus, etc. ), rashes or suffering from gastrointestinal disorders (diarrhea, vomiting). 18. The access to the Kids Club is allowed solely in socks or indoor booties. 19. The parents/ the guardian must be easily reachable and available for any needs of their children. To this purpose. the parent/ the guardian will specify upon the registration where he/she may be found within Stejarii Country Club. If the parent/ guardian does not answer an employee will personally approach him. 20. Upon handing over, the parent/ guardian will accept the whole responsibility for the child’s safety and will agree that Stejarii Country Club and its employees are released from any liability for any accident, damage or illness suffered while visiting Kids Club. The parent or the guarding must sign the registration sheet when a child is left in our care in the Kids club. 21. The normal opening hours are from Monday to Sunday, from 12.00 a.m. to 08:00 p.m. The parents/ guardians will be informed that they must come before the end of the opening hours in order to take over the child previously left in our premises, the parent will be informed on it upon registration. The opening hours may be subject to variations according to the public holidays and the operational schedule of the Complex. 22. The possible damages caused by the neglect or the improper use of the playground and/or equipments may be imputable to the parents or attendant adults at their inventory value. 23. These Regulations are notified to the children, parents, attendants upon reaching to the premises and the failure to comply with them may trigger the prohibition of the access to the premises. 25. The members of Stejarii Country Club can report to the club’s employees any failure or malfunction of the equipments, the report will be taken over and settled on the spot and if it cannot be settled immediately or it is an issue not related to this department, the employee will convey such information to an immediate superior or to the Operations Manager and will return with feedback and thanks to the client. 25. No smoking (including electronic cigarettes). 1.The Clients may reserve the Padel court on phone, solely if they have an open account (virtual wallet) and/or in person at the Padel/Golf Court Reception Desk or Concierge Department of Stejarii Country Club. 2. The cost of a court reservation amounts to: Euro 8 from 8:00 am – to 5:00 pm and RON 12 from 5:00 pm– 9:00 pm (inclusive of VAT)/hour/court, during the Club’s opening hours; the Club reserves the right to change the opening hours. 3. You may cancel the reservation at least 4 hours before the scheduled time in order to avoid any subsequent penalties. Following 3 non-complied reservations in one month, the Club reserves the right not to allow the reservation of the courts by such client the following month. 4. It is not allowed the access to the Padel court before checking whether it is available with the Concierge Department Stejarii Country Club (+40) 744.332.155 or with the Padel/ Golf Court Reception Desk (+40) 374.717.024. 5. If the players delay more than 15 minutes in relation to the scheduled time, the reservation is cancelled and the paid fee is withheld by the Club and the client is not entitled to the reimbursement of such cost and the court may be used by another member, according to the „firts come, first served” rule. 6. The Padel courts may be used from Monday to Friday from 8:00 am to 9:00 pm and in weekends from 8:00 am to 8:00 pm. The clients have access to the Padel courts according to the scheduled reservations, solely during the opening hours. We mention that the Padel/Golf Reception Desk is open from 2:00 pm on Monday and from 10:00 am from Tuesday to Sunday. 7. The playing time is limited to effectively 55′. The court will be released 5 minutes before the fixed time in order to comply with other reservations or in order to allow the access of the waiting members. The courts are scheduled and used solely at fixed hours (hh:00), never in other time bracket (e.g. at the half of hour (hh:30). 8. For equipment or accessories, please address solely to the Padel/ Golf Reception Desk (+40) 374.717.024. 9. The children and juniors have the same rights in relation to the use of the courts as the adult members. 10. The children under 14 years must be permanently supervised by an adult. 11. The participants must wear adequate equipment during the game. 12. It is forbidden the access to the Padel courts wearing inadequate footwear (spiked shoes, running shoes or other type of footwear that may damage the playing surface or may cause injuries), with rollers skates, bicycles or skateboards. 13. Smoking (including electronic cigarettes) is forbidden on the Padel courts and their area. 14. The clients are asked not to throw any object whatsoever on the court. The improper behaviours, the improper use of the netting, balls, court and Padel rackets are not allowed. The clients are liable for any damage caused by their behaviour. The waiting clients must not disturb the players on the court until the playing time expires. 15. It is forbidden the access to the Padel courts and their area, of the persons under the influence of alcohol, drugs, hallucinogens, stimulants, depression medications or any other substances diminishing the physical and mental abilities and/or their consumption while using the courts. 16. The client uses the Padel courts on his/her own responsibility. 17. The indecent, noisy behaviour or any other behaviour whatsoever that might generate conflicts or disturb the other present persons are forbidden. 18. The Client is asked to report to the staff any danger or non-compliance with the regulations (quarrels, injuries, indecent behaviour, etc.). 19. For safety and comfort purposes, the Club reserves the right to request to any person to leave the premises and to use the adequate means to this purpose. 1.The maximum allowed number of persons being simultaneously in the swimming pool is While using the swimming pool, the maximum (abovementioned) number of persons being simultaneously in the swimming pool must not be exceeded. 2. Before entering the swimming pool, you must take a shower. Before entering the indoor swimming pool (the semi-olympic pool), after taking a shower, you must not use body oils and/or ointments. 3. You must use the adequate equipment in the swimming pool area, respectively: one-piece or two-piece swimsuit, swimming cap (hair in a queue), swimming goggles, flip-flops, towel. 4. It is strictly forbidden the access to the pool area with street footwear and clothes. The exception is the temporary access with street footwear, when you must use shoe covers. 5.The white towels from Stejarii Country Club are used solely in the indoor areas (predominantly in the indoor locker rooms located in -1). The beige towels are used mandatorily in the (indoor and outdoor) pools areas. You must strictly use the beige towels in the olympic pool, as follows: 2 towels/person (a towel for beach and one for shower). They are provided after submitting a towel ticket for each separate person. At request, extra towels are provided, against payment (RON 20/towel). 6. The clients/ members are asked upon leaving the beach, to hand over the towels to the Pool Reception Desk when the towel ticket will be returned to them. 7. It is forbidden to come to the pool if you have symptoms of skin diseases, abrasions and/or skin injuries, even if the area is protected with any type of medical bandage. 8. It is forbidden the use of the swimming pool and its area by persons under the influence of alcohol, drugs, hallucinogens, stimulants, depression medications and any other substances diminishing the physical and mental abilities and/or their consumption while using the swimming pool and its area. 9. It is forbidden the access with food and drinks from outside the complex. Moreover, it is forbidden the access with food and drinks in the swimming pool. 10. It is forbidden the access with glass recipients in the pool area. 11. Smoking (including electronic cigarettes) is allowed solely in the specially-arranged areas signposted as such. 12. It is forbidden to move the chaise longues and the umbrellas from the area specially arranged for the beach. 13. The clients/ members leasing cabins must pay the reservation until 12:00 am that day, otherwise the reservation is cancelled. The cabin is for 2 persons. 14. The Platinum members are assigned 2 cabins (Monday-Friday) – the cabins 4 and 5, respectively 1 cabin (Saturday-Sunday) – the cabin 5. They may be leased free of charge, according to the first come, first served rule. If the cabin was occupied, the Platinum members may lease other unoccupied cabins against payment. The cabin will be used by the persons leasing it. 15. The kids under 3 years who are still wearing diapers, must wear a special swim diaper. Such kids (under 3 years and who are still wearing diapers) have access solely to the pools dedicated to children. 16. The children under 14 years must be permanently supervised an adult upon entering the pools. 17. Diving and jumping into the pool are strictly forbidden. 18. Save the events specially organized by Stejarii Country Club, playing with the ball in the pool and outside the pool is forbidden. 19. Running or any other behaviour that may cause injury to you or other persons around you are forbidden. 20. Any person using the swimming pool assumes the liability for his/her own activity and safety. The adult supervising a child is also liable for the child’s safety. 22. The clients/ members may use the audio/ picture/ video recording devices within the Club/ pools only if they record themselves and the members of the family, not including in the images any other person around them. In order to show respect to the other clients’ privacy and comfort, any other recording is forbidden. 23. The use of the mobile phone at the indoor swimming pool is allowed in emergency cases and for a short period of time, as it is a relaxation area. If the use of the mobile phone is required for a longer period of time, you must go to an area in the Club where the use of the mobile phones is allowed. 24. Stejarii Country Club is not responsible for the objects forgotten or lost within the Complex. 25. Stejarii Country Club is not responsible for the injuries to the clients/ members arising from the improper use of the Club’s facilities. 26. We recommend you not to enter the swimming pool with jewelleries, watches or other valuable objects. The water and substances used for the water quality may affect them in a negative way. In such case, the Club will not indemnify for the prejudices that you may suffer. Be aware that the level of chlorine and PH in water may affect certain materials of the swimsuit. 27. The clubs’ clients/ members must comply with all the posted indications and those ones from the Club’s staff. 28. If you need help, please contact Stejarii Country Club’s staff. 29. Please inform the Club’s staff on any danger or non-compliance with the regulations (quarrels, injuries, indecent behaviour, etc.). 30. Always carry out activities in the pool area under conditions of safety and respect to the others. 31. 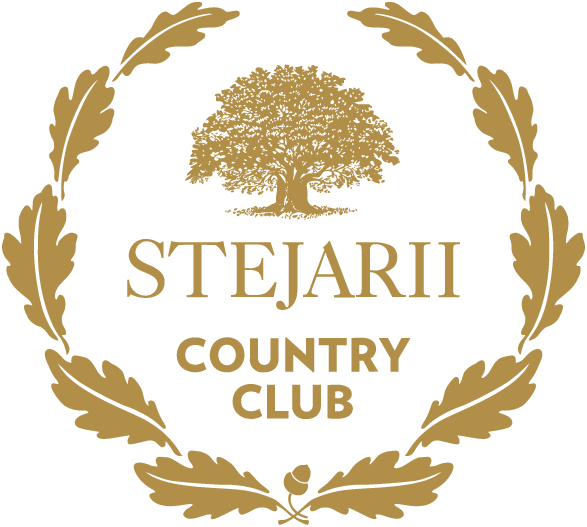 The violation of any previously mentioned rule may determine the obligation to leave the Club immediately, at the request of Stejarii Country Club’s staff. The access to the swimming pool supposes your acceptance of Stejarii Country Club’s regulations, as well as the assumption that you have read the previously mentioned regulations. Therefore, any subsequent complaint related to the above mentions will not be taken into consideration. 2. Before entering the swimming pool, you must take a shower. 3. Before entering the swimming pool, after taking a shower, you must not use ointments and/or body lotions. 4. You must use the adequate equipment in the swimming pool area, respectively: one-piece swimsuit, swimming cap, swimming goggles, flip-flops, towel. 5. It is strictly forbidden the access to the pool area with street footwear and clothes and sunglasses. 6. It is forbidden to come to the swimming pool if you have symptoms of skin diseases, abrasions and/or skin injuries, even if the area is protected with any type of medical bandage. 7. It is forbidden the use of the swimming pool and its area by persons under the influence of alcohol, drugs, hallucinogens, stimulants, depression medications or any other substances diminishing the physical and mental abilities and/or their consumption while using the swimming pool and its area. 8. The children under 14 years must be permanently supervised by an adult person. 9. The kids under 3 years must wear a special swim diaper. 10. Please do not enter the swimming pool with chewing gum/ sweets. 11. It is forbidden the access with food and drinks from outside the complex. Moreover, it is forbidden the access with food and drinks in the swimming pool. 12. Smoking (including electronic cigarettes) is forbidden. 13. Diving is strictly forbidden. 14. Jumping into the swimming pool is strictly forbidden. 15. Playing with the ball within and outside the swimming pool is forbidden. 16. Running or any other behaviour that may cause injury to you or other persons around you are forbidden. 18. The members/ clients must not use any audio or video (including pictures) recording devices within the premises. If such rule is violated, such person may be requested to leave immediately the club. 19. The use of the mobile phone is allowed only in emergency cases and for a short period of time. If someone must talk on the phone for a long period of time, he/she may use it solely in the indicated areas in the club when it is allowed the use of the mobile phones. 20. We recommend you not to enter the swimming pool with jewelleries, watches. The water and the substances used for the water quality may affect them in a negative way. In such case, the club will not indemnify for the prejudices caused to them. 21. Any person using the swimming pool assumes the liability for his/her own activity and safety while using the pool. 22. If you need help, please ask for help to Stejarii Country Club employees. 23. Please inform the Club’s staff on any danger or non-compliance with the regulations (quarrels, injuries, indecent behaviour, etc.). 24. The level of chlorine and PH in water may affect certain materials of the swimsuit. 25. For safety and comfort purposes, the Club reserves the right to request to any participant to leave the premises and to use the proper means to this purpose. 26. Always carry out activities in the pool area under conditions of safety and respect to the others. 1.It is not recommended to execute very difficult physical exercises without the trainer’s and the physician’s agreement. 2. The use of the adequate sport equipment (clothing, footwear and accessories) is mandatory. 3. It is recommended to use sports shoes with sole specific to the type of physical exercises that you are executing. 4. Before beginning the training, warm up your muscles and joints by means of the specific recommended exercises. 5. In case of executing some exercises with high weights, it is recommended the presence of a training partner or please request the help of a trainer. 6. During the breaks between the exercises, we recommend you to drink water. The hydration is essential during the physical effort. 7. In order to keep a good hygiene, please use the towel on the equipments. 8. The children under 14 years are NOT allowed in the Fitness Room other than under the strict supervision of a trainer, by buying a private training package. 9. The children under 14 years, ACCOMPANIED BY PARENTS (the payer clients of SCC) and under their strict supervision, may use (for some workouts with nothing but the body) the aerobics studio as long as it is not occupied for the group or academy classes. 10. It is forbidden the use of the equipments from the training room by the persons under the influence of alcohol, drugs, hallucinogens, stimulants, antidepressants or any substances diminishing the physical and mental abilities and/or their consumption during the training. 11. If you need help, please contact the Club’s staff. 12. Smoking (including electronic cigarettes) is forbidden in the training room. 13. Train yourself under full safety conditions, showing respect to the others. 14. The indecent, noisy behaviour or any behaviour whatsoever that might generate conflicts or disturb the other present persons are forbidden. 15. The persons use the fitness equipments on their own responsibility. 16. Please do not intervene on the equipments during their operation and do not damage them. 17. Please report to the responsible trainer or the club’s reception desk any failure or malfunction of the equipments. 18. It is forbidden to talk on the mobile phone in the fitness room, save the emergency cases. 19. Please, after the class ends, take the equipment (weights, mattresses, etc.) to the storage place in the room. 20. The Club’s members/ clients must comply with all the posted indications and those ones from the Club’s staff or trainers. 21. Please inform the Club’s staff on any danger or non-compliance with the regulations (quarrels, injuries, indecent behavior, etc.). 1.It is important to maintain the hygiene, to take a shower before using sauna. 2. The persons will use the sauna/ Jacuzzi on their own responsibility. If you have health problems, see a doctor before using it in order to make sure that the vapour bath/ high temperature does not cause you any harm. 3. The following categories of persons must not use sauna/ Jacuzzi: persons under medical care or suffering from chronic diseases, persons under the influence of alcohol, stimulants and/or antidepressants or other substances affecting the physical and mental abilities, pregnant women, old people. 4. The children under 14 years must not enter the relaxation area (saunas and Jacuzzi). Such rule is implemented both at the physicians’ recommendation and in order to avoid possible intimacy-related problems. 5. It is mandatory to use a towel in sauna. The swimsuit is mandatory when using the Jacuzzi. 6. It is strictly forbidden to use the mobile phone in saunas or Jacuzzi. 7. It is forbidden the access to saunas or Jacuzzi with food. 8. It is forbidden to put in Jacuzzi water various liquids (shower gel, shampoo, hair/body oil, etc.) or any type of object that may damage the quality of water or installation. 9. It is forbidden to change the temperature of the Jacuzzi water. The temperature is set at optimum level. Any disorder triggers a longer period of time until it is reinstated to the standard level. 10. It is forbidden the access to the dry sauna with slippers or flip-flops. 11. You must not use sauna if you ate less than two hours before going to sauna. Wait two hours after having a meal before using sauna. The heat affects the blood circulation and digestion. 12. Smoking (including electronic cigarettes) is forbidden in the sauna and Jacuzzi area. 13. You should always act under full safety conditions and showing respect to the others. 15. Please inform the Club’s staff on any danger or non-compliance with the regulations (quarrels, injuries, indecent behaviour, ). 16. If you feel dizzy, weakened or you have breathing problems, we recommend you to go out of sauna. 17. If you need help, please ask for the Club employees’ help. 18. The Clubs’ members/ Clients must comply with all the posted indications and those ones from the Club’s staff or trainers. 19. For safety and comfort purposes, the Club reserves the right to request to any participant to leave the premises and to use the adequate means to this purpose. 20. Fire Risk! Do not place objects on the hot elements of the assembly. 1.The Squash courts may be used following a prior reservation or if such courts are unoccupied by checking their availability at the Club’s reception desk. 2. The members may reserve the Squash court online (www.scc.digitalyield.ro) or directly at the Club’s reception desk. The cost of a reservation amounts to Euro 10 (inclusive of VAT) per hour, per court, till 4:00 pm and Euro 20 (inclusive of VAT) per hour, per court, after 4:00 pm. You may cancel the reservation at least 2 hours before the scheduled time in order to avoid any subsequent penalties. Following 3 non-complied reservations in 3 months, the Club reserves the right not to allow the reservation of the courts anymore by you the following month. You may reserve the court for maximum 2 hours. 3. If you delay more than 15 minutes in relation to the scheduled time, your reservation is cancelled and the paid fee is withheld by the Club and you are not entitled to the reimbursement of such cost and the Court may be used by another member, according to the „first come, first served” rule. 4. The Squash courts may be used from Monday to Friday from 6:00 am to 10:45 pm and in weekends from 8:00 am to 8:45 pm. The members have access to the Squash courts according to the scheduled reservations, solely during the opening hours. 5. The playing time is limited to effectively 55′. The court will be released 5 minutes before the fixed time in order to comply with other reservations or in order to allow the access of the waiting members. 6. The children and juniors have the same rights in relation to the use of the courts as the adult members. 7. The children under 14 years must be permanently supervised by an adult. 8. All the sportsmen and members will use the equipment proper to the playing surface/ training premises. It is forbidden the access with sports black-soled shoes. The participants must wear adequate equipment during the game. Protective equipment is recommended ! 9. It is forbidden the access to the Squash court wearing inadequate footwear (spiked shoes, running shoes or others that may damage the playing surface or may cause injuries), with roller skates, bicycles or skateboard. 10. Smoking (including electronic cigarettes) is forbidden on the Squash court and its area. 11. Do not throw any object whatsoever on the court. The improper behaviours, the improper use of the balls and Squash rackets or those ones that might generate risks of injury are not allowed. The members are liable for any damage caused by their behaviour. Do not disturb the players on the court until the playing time expires. 12. It is forbidden the access to the Squash courts and their area, of the persons under the influence of alcohol, drugs, hallucinogens, stimulants, other depression medications or any other substances diminishing the physical and mental abilities and/or their consumption while using the courts. 13. You use the Squash courts on your own responsibility. 15. For safety and comfort purposes, the Club reserves the right to request to any participant to leave the premises and to use the adequate means to this purpose. 16. Please report to the staff any danger or non-compliance with the regulations (quarrels, injuries, indecent behaviour, etc.). 1.The members may reserve the tennis court on phone or directly to Concierge Department Stejarii Country Club. The cost of a reservation amounts to Euro 10 (inclusive of VAT) per hour, per court, till the 4:00 pm and Euro 20 (inclusive of VAT) per hour, per court, after 4:00 pm. You may cancel the reservation at least 2 hours before the scheduled time in order to avoid any subsequent penalties. Following a non-complied reservation in one month, the Club reserves the right not to allow the reservation of the courts anymore by you the following month. You may reserve the court for maximum 2 hours/day. If you are in the club and the court is available, you may use it without any further cost. 2. The tennis court may be reserved 24 hours before. The reservations exceeding 24 hours are not valid. 3. It is not allowed the access to the court, if it is available before verifying together with Concierge Department (+40)744.332.155. 4. If you delay more than 10 minutes in relation to the scheduled time, your reservation is cancelled and the paid fee is withheld by the Club and you are not entitled to the reimbursement of such cost and the court may be used by another member, according to the “first come, first served” rule. 5. The tennis courts may be used from Monday to Friday from 6:00 am to 10:45 pm and in weekend from 8:00 am to 8:45 pm. The members have access to the tennis courts according to the scheduled reservations, solely during the opening hours. 6. The playing time is limited to effectively 55′. The court will be released 5 minutes before the fixed time in order to comply with other reservations or in order to allow the access of the members waiting. The members using the courts must redo the court surface at the end of the activity. The courts are scheduled and used solely at fixed hours (hh:00), never at the half of the hour (hh:30). 7. The children and juniors have the same rights in relation to the use of the courts as the adult members. 8. The children under 14 years must be permanently supervised by an adult. The participants must wear adequate equipment during the game. 9. Do not take your tennis ball by yourselves from the neighbouring court, you should wait until you are allowed to do so. 10. It is forbidden to enter wearing clay court shoes the HARD COURT tennis court, the building, the fitness room as well as the padel and squash courts. The clay court shoes are worn solely on the CLAY tennis courts. 11. It is forbidden the access to the tennis court wearing inadequate footwear (spiked shoes, running shoes or others that may damage the playing surface or may cause injuries), with roller skates, bicycles or skateboard. 12. Smoking (including electronic cigarettes) is forbidden on the tennis courts and their area. 13. Do not throw any object whatsoever on the court, the improper behaviours, the improper use of the netting, balls and tennis rackets or those ones that might generate risks of injury are not allowed. The members are liable for any damage caused by their behaviour. Do not disturb the players on the court until the playing time expires. 14. It is forbidden the access to the tennis courts and their area, of the persons under the influence of alcohol, drugs, hallucinogens, stimulants, depression medications or any other substances diminishing the physical and mental abilities and/or their consumption while using the courts. 15. You use the tennis court on your own responsibility. 16. The indecent, noisy behaviour or any behaviour whatsoever that might generate conflicts or disturb the other present persons are forbidden. 17. For safety and comfort purposes, the Club reserves the right to request to any participant to leave the premises and to use to this purpose the adequate means. 18. Please report to the staff any danger or non-compliance with the regulations (quarrels, injuries, indecent behaviour, etc.). The access to Stejarii Country Club and Shiseido Spa @ Stejarii Country Club supposes your acceptance of Stejarii Country Club’s regulations, as well as the assumption that you have read the previously mentioned regulations. Therefore, any subsequent complaint related to the below mentions will not be taken into consideration. 1.We recommend you to schedule your therapies ahead of time. 2. The appointments and the purchases are subject to the Shiseido Spa Policies for Cancellation, Non-Appearance and Purchases. A treatment non-cancelled minimum 6 hours before will be paid in full. 3. Taking pictures or video recording are strictly forbidden, save the cases approved by the centre’s management. 4. Upon coming, you will be asked to fill out a Registration Form so that the therapist may identify possible contraindications and adjust the therapy according to your needs. The information will be confidential according to the confidentiality policy. 5. If you suffer from high blood pressure, allergies or other medical disorders, we recommend you to see a doctor before making appointments for spa therapies. 6. Smoking, eating food and drinking alcohol are not allowed in spa, save the products provided in spa. 7. Shiseido Spa reserves the right to refuse the access and the treatment of any person under the influence of alcohol or drugs/ other forbidden substances. 8. The access of the children under 16 years to the spa is forbidden. 9. The Spa Centre does not assume the liability for the loss or deterioration of any personal effects or valuable objects; you are recommended not to bring jewelleries, mobile phones, iPads, tablets or other similar objects to spa. All the clients must lock their goods in the individual locker rooms (including shoes). 10. Please be at least 15 minutes before the appointment time, in order to register and prepare yourself. If you are late, the therapy time will be reduced, but the full cost of the treatment will be paid. 11. Before and after appointments, we invite you to relax at the Vitality pool, in the Zen room, in the dry and wet sauna, at Hammam and enjoy the provided water. 12. The Spa will provide to the clients a free of charge tea/ visit. The subsequent requests will be against payment. 13. The swimsuit is mandatory at the Vitality pool, in the Zen room, and in the dry and wet sauna. 14. The men are recommended to shave 3 hours before the face treatments. 15. In order to keep a relaxing environment, the mobile phones and other electronic devices must be turned off when leaving the reception desk and must be so during the visit. 16. In order not to disturb, please move in quiet and talk in a lower voice. 17. We reserve our right to refuse the access (including to cancel the subscription) of the persons not complying with the Internal Regulations, good conduct rules or causing moral or property damages material to the spa or the spa members/ clients. 18. Bathing gowns, slippers, disposable linen, towels, locker rooms, showers, hair dryers, water are provided to the clients. 19. Before proceeding with the therapies, it is mandatory to take a shower. 20. Before proceeding with the therapies, the jewelleries must be removed. Moreover, for an increased comfort, we recommend you to remove the glasses, contact lenses and hearing aids. For your safety, you may remove them once you enter the treatment room, before proceeding with the therapy. We encourage you to ask for assistance to the therapists. 22. Please inform the therapists if you want to change the pressure, temperature, light or other factors in order to increase your comfort and satisfaction. 23. Some ointments and oils used in treatments may stain your clothes. 24. For safety and comfort purposes, the Club reserves the right to request to any participant to leave the premises and to use the adequate means to this purpose. The access to Medusa Hotel International supposes your acceptance of the Regulations of Medusa Hotel International, as well as the presumption that you have read the tenor of the aforementioned Regulations. As such, any subsequent complaint related to the below mentions will not be taken into consideration. The violation by any client/ visitor/ provider of the rules related to the vehicles’ access and standing within the premises may trigger the prohibition of the access for the motor vehicles belonging to him/her or that such client/ visitor/ provider uses. By requesting the issue of a ticket for access by the vehicle to Medusa Hotel International, the motor vehicle driver accepts and undertakes to comply with the conditions of these Regulations and traffic signs within the premises. The Regulations apply to all the persons having access to Medusa Hotel International/Stejarii Country Club and aims at the parking places themselves and the access ways from/ to them, as well as the accessory premises serving them. For members and subscribers, the Regulations are supplemented by the contractual provisions. 1. For the purpose of these Regulations, the parking places are specially arranged and marked premises. 2. Each driver will park the motor vehicle so that he/she occupies a sole parking place, making sure that he/she does not exceed the marked limits of the parking place he/she wants to occupy. 3. Medusa Hotel International reserves the right to delimitate certain areas within the underground parking where specific rules exceeding these Regulations will be implemented. 4. The access to the underground parking is provided by requesting and procuring the access ticket. One leaves the underground parking after he/she validates the access ticket and, where applicable, pays the parking fees, by using the access ticket. 5. If one leaves the underground parking without paying for the payable parking fees is subject to sanctionS according to these Regulations. 6.The schedule for the parking is: Monday-Friday from 06.00 am to 11.00 pm, Saturday-Sunday from 08.00 am -to 11.00 pm. 7.According to the level of occupation of the parking places or other exceptional cases, Medusa Hotel International may restrict temporarily the access to the underground parking. If there are no more parking places available in the underground parking, the visitor will park the vehicle outside the establishment. 8.The issue of a parking ticket does not suppose compulsorily the provision of a parking place. 9. The pay parking within Medusa Hotel International is based on the hourly-fee-principle. 10. In the first 30 minutes calculated from entering, one may leave the premises without paying for the parking fees and validating the ticket. 11. The parking fees amount to RON 10 /h (inclusive of VAT) and may not be split. Any division of the time bracket will be charged by taking into consideration 1 full hour. After paying the parking fees, respectively after validating the parking ticket, one may leave the establishment within maximum 15 minutes. a. By using the automatic machines located within the establishment (in the areas A and C of the underground parking), by bank notes or coins. Bank notes of a higher value than RON 10 and the coins of other value than bani 50 are not accepted. b. At the Concierge Department of Medusa Hotel International/Stejarii Country Club by submitting the access ticket. 13. In case of loss, destruction or deterioration of the parking access ticket, the issue of a duplicate may be requested at the Concierge Department against an amount of RON 150 (inclusive of VAT). The fees for the issue of the duplicate will be incurred by the client, even if the client is during the free of charge parking periods. A duplicate may be issued and paid from Monday to Friday from 06.00 am to 10.00 pm and Saturday-Sunday from 08.00 am to 9.00 pm, at the Concierge department. After the working schedule of the Concierge Department, for the issue of a duplicate, one may call 0744 332 322. The payment of the equivalent value of the duplicate does not exclude the payment of the parking fees. The equivalent value of the duplicate is not reimbursed. 14. In case of loss of the parking ticket, the driver must specify the number of the motor vehicle for which he/she lost the parking ticket in order to be identified in the automatic system. 15. The presence of the motor vehicle in the parking is allowed solely as long as its user is within the establishment. The motor vehicles parked in violation of the regulations, on other parking places than those specially arranged ones or occupying several parking places, on the runway or leaving the underground parking without paying for the payable parking fees or violating in any other way the provisions of these Regulations, are prohibited the access to the establishment. 16. The maximum admitted height for motor vehicles is 2.00 m.
17. The maximum admitted length for motor vehicles is 5.50 m.
18. The maximum admitted speed for motor vehicles within Medusa Hotel International is 15 km/h. 19. It is forbidden the access of the animal-haulage vehicles, as well as of the motor vehicles equipped with LPG installations, of those ones equipped with tows and as well as of the means of transport of total weight exceeding 3,5t. 20. The parking places, the access ways to/ from them and the accessory premises serving them will be used according to their intended purpose, in compliance with the rights of the other persons having access to the establishment, as well as the obligations provided for herein and in the applicable laws. 21. The motor vehicles will be parked solely on the places mentioned and marked to this purpose in compliance with the markings and it is forbidden to render unavailable a parking place by parking a vehicle more than on a parking place and/or blocking the access to other vehicle. 22. It is strictly forbidden to park the motor vehicle at the entrances or the access ways. 23. It is forbidden any noisy manifestation in the underground parking of Medusa Hotel International save when it was procured the written prior approval of Medusa Hotel International. 24. It is forbidden the access with animals within the parking. 25. It is prohibited the motor vehicles’ parking/ standing after the parking working schedule. 26. The surveys, quotations, peddling, religious proselytism actions or election-campaigns-related actions, as well as other such activities are forbidden within the establishment. d. Not to let the underage children unsupervised in parking or in the parked motor vehicles. 28. The drivers will not enter the parking without the ticket issued upon the barrier’s lifting, taking into account that it is allowed to exit the parking solely after the equivalent value for parking has been paid, where applicable, and after the ticket has been validated. 29. The driver will keep clean and tidy the parking place and will not warehouse any materials whatsoever within the parking place or the accessory premises thereof. 30. The driver will not carry out works of maintenance, repairs, washing, cleaning to the motor vehicles on the parking places or within the parking. 31. The driver will comply with the specific fire fighting rules and the driver is directly liable for the possible caused damages. 32. The driver will make sure that the vehicle is in adequate technical and operational condition and the driver will be solely liable for any damages or inconveniences caused by the vehicle malfunctionings. At the request of Medusa Hotel International personnel, the driver will submit a document issued by the Romanian Automotive Register (or the competent authority) certifying that the motor vehicle complies with these applicable rules (including as to the toxic emissions and noise). 33. The driver must secure his/her assets left in the motor vehicle, by blocking any way enabling the access in or to the vehicle, by closing the doors, bonnets, trunk, windows, tank cap, etc. and Medusa Hotel International is not liable in any way for their safety. 34. It is forbidden to bring and/or warehouse/ abandon within the premises some chemical substances, explosives or contaminating substances, wastes, guns, forbidden substances, valuable assets, as well as any materials and/or goods that by their nature or by a misuse may cause dangerous events, thus endangering the life and/or the integrity of the persons in the building and/or the integrity and functionality of the building or of the assets existing in it. Otherwise, Medusa Hotel International (or the persons empowered by it) will take immediately the required measures in order to remove/ destroy such substances, wastes, materials, objects, and such removal/ destruction will be on the liability and at the expense of the guilty person. 35. The persons having access to the establishment will tolerate the possible inconveniences caused by the works of preservation and maintenance to the building carried out by or for Medusa Hotel International. 36. Medusa Hotel International is not liable in civil or penal terms for the possible damages, thefts, fires at the vehicles in the parking. 37. Medusa Hotel International is not liable for the damages caused to the motor vehicles, the goods in such vehicles or the persons as a consequence of some actions or inactions imputable to other persons. 38. The possible damages caused to their own motor vehicles as well as to other motor vehicles, goods or building, as well as to the installations or equipments belonging to Medusa Hotel International by the drivers or other users of the parking during the driving or standing in parking will be fully incurred by the guilty persons, and Medusa Hotel International will have no liability. 39. Medusa Hotel International is not liable for the accidents or any other events suffered by the users of the parking as a result of negligence, using improperly the stairs, doors, barriers or other equipments, installations or other alike belonging to Medusa Hotel International or for any other reasons. 40. If the effective legal provisions are violated, Medusa Hotel International will inform the competent state bodies for the purposes of ascertaining the deed and imposing proper sanctions and reserves the right to recover the prejudices whatsoever from the responsible persons. 41. If any provision of the Regulations is violated, Medusa Hotel International will take measures in order to remove the vehicle away from the premises or to block it. It will be unblocked after the related costs and the related parking fees have been paid.